Now, I must qualify the basis for this review. We got off to a rocky start this morning. I was all set to do the purr-fur-mance review, and HH was so excited about the fact that the files for The Zen of Max for Kindle came in that she hogged the computer uploading the files. Now, I would forgive her that, but this next item is a little too convenient. 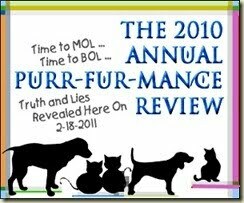 I think she was a little nervous about what I might say in this review because I can't find the Purr-Fur-Mance Review form on the hard drive. Did somebody delete it? Not accusing.... just saying, it's missing. Quantity of Output... I give HH three paws for quantity of output. She receives that high a score because I do understand that she has four active blogs. But as mine is the most important, I do expect a daily, quality post. In 2010, she probably averaged 2 to 3 posts per week. Lately, however, she has been posting almost daily. So, I hold out hope we'll be able to up that rating next year. Quality of Output... I give HH four paws for quality of output. She does aim for variety and quality in her posts... Of course, I am the Quality Control Division Head at this blog, so I have been working with her to ensure your have quality material to read. For example... Max's Mystery Novel - my idea; featuring shelter animals - my idea, putting up Mousey pictures - my idea... Are you catching a trend here? So, four paws it is...! Client Pawticipation... HH does a great job in this area. In fact, I pretty much have lots of input. So I thank her for that confidence in me and give her four paws in this area as well. Have a great day... Overall rating is...... 3.625 paws... Congrats, HH! Dats a lot of paws!!! I do say dat your Mom is doing a great job in her position of .... your faithful secretary. Ummm, that seems fair...good suggestions! but I personally think the blog is lovely~ what with the topic being you? how could she go wrong? Max you are wise beyond your years to give the HH such a high rating. After all she has the thumbs in the relationship and if mad she can make your life miserable. Great review Max. That is a great rating. We think your blog is just terrific and we like mousie a lot. So good job to all. We loved this. If we gave our Mama a review it probably wouldn't be as good. You know we have to share our time with her because of the no good chihuahuas. Excellent review for HH fur sure! I know your steering the ship but she does an excellent job navigating for you Max! Pawesome work my friend! I think HH is doing a wonderful job with this blog for you (I know you are in charge of everything here, but we can give her some little credits every now and again)! Wow, I guess you want to be sure the boys get their treats with that wonderful review to put HH in a good mood. Mom and I do enjoy your blog a lot. A most excellent review and congrats to da HH! So glad I didn't review mum...it would haves been BAD. I think she should get extra paws for bringing home Bugsy and Knuckles - they are a definite enhancement to your blog! I have said it before and I will say it again...FOUR BLOGS!!!!! That fact alone is worth TEN PAWS! I can barely keep up with ONE blog, let alone TEN! You did a great job on this review! That was a very fair appraisal, Max! And considering HH has 4 blogs going, we are impressed that she takes care of you as well as she does!! 4 paws from us!! That's a pretty good review! I kinda think HH deserves a full 4 stars, but I have to respect your decision. Thank you so much for your purrs during my dad's illness. The kindness of the CB was very comforting during that rough week, and you are a big part of that. Thank you.